One of the things that I'll never forget about my dad was how he cared for his bike. It wasn't anything special, just a little Honda GL 500. He was a fair weather rider by the very definition of the term back in those days, and even though he didn't ride through any puddles or let it sit in the rain, after every ride he would always spend about twenty minutes polishing it up and making it look as good as when he brought it home the first day. 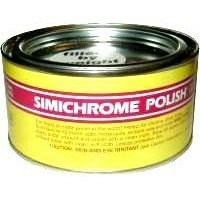 I bet he would have dug getting some of the Simichrome polish for his birthday. It comes in various sizes, and not only does it clean, but it also protects. It can be used on aluminum, brass, and basically any metal that you might want to shine. You can bring the dull -looking chrome fender that's been weathered back to its glorious eye-blinding beauty. Maybe you're not as particular about the way your bike looks, but seriously, the last thing you want people noticing is the rust spots near the exhaust pipes, or the scratches in the handle bars. I'm not saying that you should be as OCD as my dad, but you should be proud of the way your bike looks as you're riding it. Click here to find this polish on Revzilla.com.